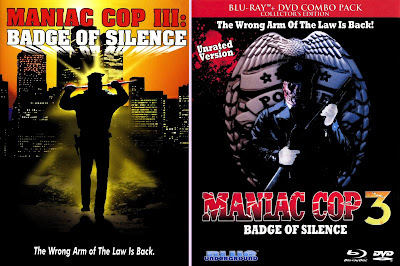 Man, the wait for Blue Underground to finally regain the rights to release the Maniac Cop sequels the right way has been a long, highly anticipated one. 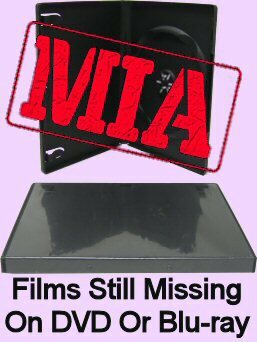 For ages, we've had nothing but cheap-o, barebones DVD releases, which is pretty rare for William Lustig and Larry Cohen films, especially two of their most popular. But at least First Look's DVD of Maniac Cop 3 was widescreen, with a decent picture. Maniac Cop 2 was fullscreen. 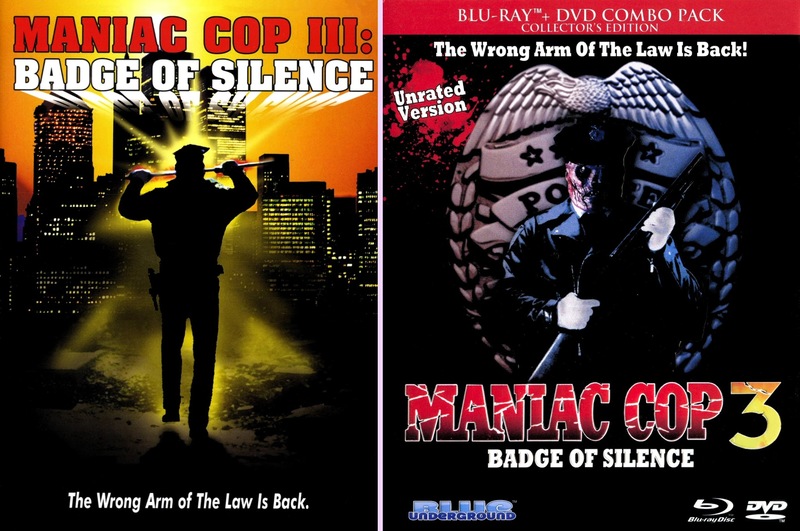 And considering Maniac Cop 3 is the one the filmmakers disavowed anyway, 3 was the less crucial of the two. But as soon as its pre-order was up, I still jumped on. Even if the control of the film hadn't been wrested away from Lustig and Cohen by the producers with changes made against their will (Larry's left his on, but Lustig took his name off the picture), I still think it would've been the weakest entry. Suddenly we've got voodoo and Cordell spends half the picture stalking around a hospital like a generic slasher. But if you look past the problems, it's still a pretty fun movie. It's got lots of witty Cohen moments and some spectacular action sequences (or at least one super-mega one at the finale) by Lustig. Robert Davi returns as the lead, supported by some more great character actors in the minor roles; and the "Bride of Maniac Cop" angle is fun in a B-movie kind of way. It doesn't do the best job of standing up against the first two films, but viewed as just a little, low budget horror flick in a vacuum, it's pretty enjoyable. Now, it's worth noting that there was a slightly trimmed R-rated cut and a full unrated cut released on video back in the day. 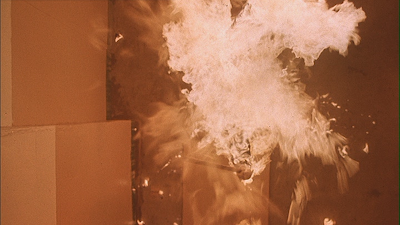 I think the R-rated cut may have even seen its way onto DVD in the past. But both the BU and First Look releases contain the uncut unrated version. First Look's 2004 DVD on top, Blue Underground's 2013 DVD mid, and BU's blu bottom. It turns out Blue Underground made a potentially controversial decision with their blu-ray of Maniac Cop 3: they framed it at 2.35:1. Was it really shot for that ratio? First Look's DVD is anamorphic 1.78:1, and it looks much more natural. Heck, it was originally released as a TV movie on HBO, where it played 1.33:1; but I do believe it was shot with widescreen in mind. I mean, I'd easily accept that it was meant to be slightly matted down to 1.85:1. But the 2.35:1 isn't giving us any extra picture on the sides, it's just doing a lot of vertical cropping. Some shots look better than others, of course, but comparing the full films side by side, I tended to prefer First Look's older disc. There are close ups where people's chins drop out of frame whenever they talk. First Look DVD left, Blue Underground blu-ray right. Of course, framing aside, there's no question Blue Underground's new blu is far superior in all other aspects. It's a much cleaner, clearer HD image with more vivid and darker colors (First Look's blacks are faded gray not actual black), and it's just so much more attractive to look at. The DVD included in BU's combo package handles the SD compression better than First Look. Obviously HD is the way to go if you've got the player, but even if you can only play DVDs, I'd recommend BU's. First Look had Spanish subtitles and a stereo audio track, which was nice; but BU kicks it in the teeth in that regard. It's got a 5.1 DTS-HD track, a 2.0 stereo track, and a whopping ten different subtitle tracks, including English. 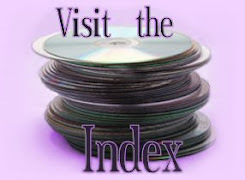 It's also enhanced for D-Box motion control systems, if you're one of the five people on Earth who has a use for that. And extras, yes. I was a pleasantly surprised the First Look DVD had the trailer, which Blue Underground also has. But of course Blue Underground has substantially more. Although, actually, it doesn't have an audio commentary, which you'd expect from Lustig and Cohen, especially on Lustig's own label. This is not the loaded special edition I'd anticipated. But it does have some good stuff, the crown jewel of which is a 25-minute 'making of' featurette. It's not afraid to tell the real, not entirely happy story of the film, and includes interviews with Lustig. Cohen, Davi, Robert Z'Dar, DoP Jacques Haitkin, Caitlin Dulany, Gretchen Becker and stuntman Spiro Razatos. 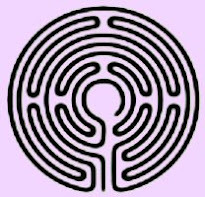 It's really great, just surprising to see it's nearly by itself. There's several deleted scenes, which are a treat to see, and a photo gallery, and that's it. It comes in a slipcover, too; so I guess there's that. Maniac Cop 3 is a better film then it gets credit for, even if it's not as strong as the other two. And Blue Underground's blu-ray is the definitive release... even though, honestly, I still don't agree with the AR. I don't care what Lustig says; it looks like a 1.85 movie to me. But this aspect ratio doesn't look awful or anything, and it's clearly been carefully re-framed to look as good as it can. Next time I watch this film, I'm going to watch the Blue Underground, not the old First Look. But I can't help wishing Arrow would get a hold of it and do even more with the title. But I have a hard time imagine Lustig letting another label handle his film better than his own label, so this is probably the best we'll ever get. And it really is pretty good, especially compared to other films that don't even have proper releases yet, let alone special edition blu-rays. I've always notice that similar widescreen ratio with VIGILANTE,which also looks like it was originally a 1:78-1:85 ratio film that was blown to 2:35 ratio for its widescreen VHS video,DVD,and Blu ray incarnations. The question that I have more for William Lustig is why hasn't be brought those Hammer Films titles that he obtained the rights to(for Anchor Bay's late 90s releases) for new DVD/Blu ray releases,since he surprisingly cut loose DRACULA;PRINCE OF DARKNESS,FRANKENSTEIN CREATED WOMAN,and LEGEND OF THE SEVEN GOLDEN VAMPIRES as Lionsgate DVD/Blu ray releases.